What impact do raids have on children and youth? Research consistently shows that immigration enforcement actions have a harmful impact on the health, safety, academic performance and overall well-being of children, including U.S. citizen children living in mixed-status families. According to a 2010 report by the Urban Institute, children who witnessed parents or family members apprehended in a home raid were much more likely to experience symptoms of post-traumatic stress disorder than children whose parents were arrested in other settings, including greater changes in sleeping and eating patterns and much higher degrees of fear and anxiety. Several teachers in North Carolina also reported significant behavioral changes and increased absenteeism among students following a local community raid, including among U.S. citizen students. Are there places where raids are prohibited? public demonstrations, such as a march, rally or parade. Note: The sensitive locations policy memorandum may be reversed. School leaders should stay informed about possible changes. Is there a federal law that prevents schools from sharing student information? Yes. Under the Family Educational Rights and Privacy Act (FERPA), schools are prohibited, without parental consent, from providing information from a student’s file to federal immigration agents if the information would potentially expose a student’s immigration status. If ICE agents present a school with a removal warrant (deportation order), the school is still permitted to refrain from providing student information, as the warrant is administrative, not judicial. Under FERPA, schools may disclose directory information without consent, but they are required to allow parents and eligible students a reasonable amount of time to request that the school not disclose directory information about them. Some schools [and the Southern Poverty Law Center] have also interpreted the Plyler decision as prohibiting them from requiring students to provide Social Security cards or birth certificates as a condition of enrollment, test taking or participation in school activities. For more on FERPA, see familypolicy.ed.gov. Issue a statement—in English and in other languages spoken at the school—articulating that the school supports immigrant students/parents and affirming publically that it is a welcoming site. Stress the importance of taking proactive steps to ensure the safety and well-being of children and entire communities. Distribute “know your rights” materials to students, families and communities about what to do if a raid occurs or an individual is detained. Identify a bilingual person at your school who can serve as the immigration resource advocate in your building or on your campus. Work with parents to develop a family immigration raid emergency plan. Provide a safe place for students to wait if a parent or sibling has been detained. Provide counseling for students who have had a family member detained by ICE. Work with your school board to pass a resolution affirming schools as welcoming places of learning for all students, distancing the schools from enforcement actions that separate families. Strengthen relationships with local institutions of higher education and community-based organizations that can support the needs of unaccompanied children and students with interrupted formal education. Maintain—in English and in other languages spoken at the school—a list of resources, such as the names of mental health providers, social workers, pro bono attorneys and local immigration advocates and organizations that can be shared with your students and their families. Partner with a pro bono attorney, legal aid organization or immigrant rights organization to schedule a “know your rights” workshop on campus to inform students and families about their rights. Find out if there is a local immigration raid rapid response team. These teams usually consist of attorneys, media personnel and community leaders who may be able to provide support. Participate in National Educators Coming Out Day, held annually on November 12, and “come out” in support of undocumented students. Participate in National Institutions Coming Out Day, held annually on April 7. For additional tools and model resolutions to create safe, welcoming environments for all students, visit aft.org and see the toolkit for this story. Advocate to stop raids and halt deportation proceedings. Unaccompanied children and youth should be in school, not in detention centers awaiting deportation. Educators can play an important role in protesting raids and halting deportation proceedings. For example, if a student has been detained by ICE, you can send a letter of inquiry to the U.S. Department of Homeland Security, asking for prosecutorial discretion to be exercised or considered, or you can file a formal civil rights complaint with the U.S. Department of Education’s Office for Civil Rights. 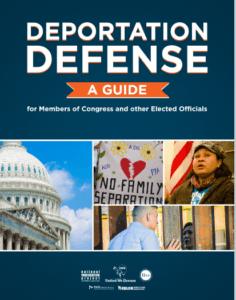 You can also distribute the United We Dream deportation defense guide, which was published to inform members of Congress and other elected officials about the role they can play in stopping the deportation of their constituents and other community members. Elected officials have successfully advocated for individuals in removal proceedings for years and continue to employ this process to help immigrant communities even today. The guide is also a useful resource for community advocates and people in deportation proceedings seeking support from their elected officials. Download the guide here. Forbids immigration enforcement agents from going on campus without approval from the superintendent and the LAUSD law office. Forbids school staff from asking about a student’s immigration status or that of family members. Provides teachers, administrators and other staff with training on how to deal with immigration issues and how to notify families in multiple languages of issues. Asks all schools to treat students equitably, including those receiving free and reduced price meals, transportation and other services. Such resolutions can also improve protections for students by affirming that the schoolhouse doors are open to all students, no matter their prior academic attainment or their language proficiency. For additional information about what actions cities and counties can take to protect immigrants and make communities welcoming places for all, visit Cities for Action. Make public statements. Educators, administrators, students and community allies can make public statements denouncing immigration enforcement raids to reassure students and families that their local school remains a safe haven. Create an online petition to prevent a student’s deportation. Online petitions are powerful tools for building public awareness and community support. See the NotOneMoreDeportation.com petition for 19-year-old Kimberly Pineda Chavez, who was detained in the United States after escaping violence in Honduras. Organize a rally or walkout opposing ICE raids and deportations. In February 2016, educators and community allies in Durham, North Carolina, organized a rally in support of a high school student detained by ICE. Actions like this help to support individuals fighting their deportation cases. The student’s teachers even mailed school assignments to his detention facility to help him stay on top of his work. “There is nothing that will hold me back from giving a kid his classwork and finish their education and graduate,” teacher Ellen Holmes told a local news station. Please let us know if you have any questions, comments or additional information.